1.Diesel engine: Powered by heavy duty industrial diesel engine, with Cummins engine. 2. Cooled system:Radiator 50 degrees max, fans are driven by belt, with safety guard. 3. AC power output: 12/24DC start motor and storage battery. 4.Alternator:Brushless, self-excited, IP22/23, insulation H alternator. 5. Absorber to reduce vibration. 6. Dry type air filter, fuel filter, oil filter. 7. Main line circuit breaker. 8. Control system: key start control panel as standard, digital auto start or ATS system is optional. 9. 8 hours operation base fuel tank. 10. High efficient muffler to reduce noise. 11. Ripple flex exhaust pipe, exhaust siphon and flange etc. 12. 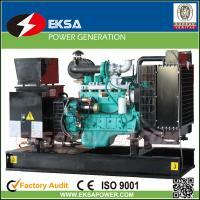 Genset type: open type or soundproof/silent type, or trailer type. 13. Maintenance and operation manual for generator, quality certificate, etc. 14. Rigorous testing must be done before delivery, including 50% load, 75% load, 100% load, 110% load and all protection function (over speed stop, high water temperature, low oil pressure, battery charging fail, emergency stop).